Aside from actually purchasing your home or office building, the roof is by far the most expensive replacement cost associated with ownership. You want your roof to last for as long as possible, and you want to take steps to keep it in top working condition. The last thing you want is a costly roof repair in Avondale associated with one of the 5 things that will kill your Arizona roof. So pay attention, because knowing about these things and being able to prevent them are key in just how long your roof is going to last you. Right off the bat this is going to be a HUGE problem if for any reason your roof is improperly installed. The roof manufacturer always details exactly how the roof should be installed and if that is not followed then you can most likely count on the roof to either fail or perform poorly against the elements. This is why it is key to go with an experienced, trustworthy Avondale roofer, as anything less runs the risk of not following the manufacturer’s guidelines. Many times, a lower quality roofer will even bail when it’s time to correct a mistake they made. Choose your roofer carefully and wisely. 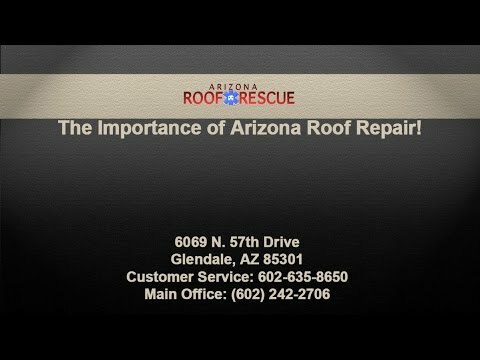 Like Arizona Roof Rescue: we’ve been in business for years and are a licensed, bonded and insured establishment. You can check our many reviews and references to be sure. But no matter who you go with, make sure they are on the up and up. We all have things that need to be installed on or around our roof. Whether it’s satellite dishes, air conditioning units, skylights, antennas or solar panels, they all can create holes in your roof, or roof perforations. Now this is not to say that you can’t install anything on your roof, but it does mean that you may need to consult with a professional roofing contractor to organize the projects you are looking at completing. You’re covering your own back in this situation, as the roofer will be sure not to compromise the integrity of your roof and keep your warranty intact. Some of the installs we used as an example do come with added insurance for your roof but even so it is wise to work with a professional in order to avoid any damage to the roof itself. It is unfortunately common for homeowner to make the mistake of using a pressure washer to clean their roof of any trash or buildup. Depending on what type of roof you have the super strong jets of water can majorly damage your roof and possibly destroy the substrate, membrane or structure. If you do this you can most likely kiss a cheap repair goodbye because it is not something that is covered by your local roofer or materials manufacturer. In any situation it would be wise to contact your local roofing professional to clean your roof. This way you can rest assured that the job will be done right, without adding any damage to your roof. Ask any expert roofer and all of them will tell you about the importance of proper attic ventilation. If for some reason your roofer isn’t bringing it up, then it’s time to hire a new roofer. Poor ventilation can cause a whole bunch of damage to your roof. As well as void your warranty. So be sure to go with the best when it comes to keeping your attic properly ventilated. Roof manufacturers design their materials with a special purpose in mind. And there is a good percentage of roofing products and makers that allow for installing a new roof on top of the old one. And many times this will compromise the integrity of your roof and void your warranty. There are a whole bunch of reasons why roofers would do this, but the negatives include the weight of the two roofs combined, performance and design. If for any reason a roofer tries to convince you to install a new roof over the old one and skip tearing the old one off of the house please make sure they are reputable and know what they are talking about. You don’t want to cut corners when it comes to your roof.